People who know Mario Rios know two things about him. He is super nice and he knows A LOT about grappling! Mario is a very caring and passionate instructor. He has been involved in wrestling, judo and BJJ for almost 20 years. This incredible experience in grappling provides a wealth of information anyone interested in advancing his or her grappling knowledge. If you take Mario’s classes you can look forward to highly detailed technical instruction explained in a way that you can easily understand and implement right away. He has helped many people advance in the grappling arts with his organized and systematic approach to grappling. Mario started his training with grappling in 1995 while he was a student at Fresno State College. In Fresno, there were no Jiu-Jitsu studios, so he started working out his house with Jason Hannen, now a black belt at Pacific Martial Arts. Most of the techniques were drills based on Renzo and Craig Kukuk videos, since youtube was nonexistent, and information was hard to come by. In those early days Mario sought out other Brazilian Jiu-Jitsu students who were commuting long distances to train at some of the Gracie Academies and began training regularly with them. Some of these partners were wrestlers from Fresno Pacific and Fresno State. During this time, Mario was also training at the Fresno Judo Club before moving from the area. After completing college, Mario was faced with the decision to relocate. He had two requirements, finding a job, and finding his passion, Jiu Jitsu. Mario found both and moved to the Bay Area in 1996. In the beginning, he took classes with Claudio Franca. Although he enjoyed the classes because of such a long commute to Santa Cruz, he decided to train in Mountain View at Ralphs. Training at Ralphs was a great experience. Mario was able to train with some of the premier grapplers at the time and began to really understand the dedication necessary to excel at this art. In 1999 began training with Michael Jen. Michael’s unique approach and attention to detail was different from the Jiu-Jitsu he had experienced in his earlier training. Mario was impressed with Michael’s highly detailed instruction and his openness to share techniques. In 2010, when the first Smash Gyms opened Mario immediately became a leader in the gym and helped many people in different programs. 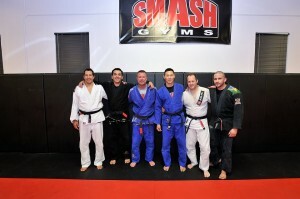 The environment and resources that Smash provided motivated Mario to focus and push himself until he received his Black Belt in 2011 from Michael Jen. Mario believes Smash Gyms amazing instructors and members helped push him to reach his long-time goal of becoming a BJJ Black Belt. After seeing the incredible growth of Smash and the value that it has brought to our members, he decided he wanted to help open another Smash in San Jose. Mario is co-owner of San Jose Smash Gyms and will be working full-time and teaching BJJ classes along with fellow BJJ Black Belts Rudy Sanchez and Michael Jen. Mario’s goal is to bring as much value as possible to Smash members in Evergreen and East San Jose.